In speaking with chief information officers (CIOs) at several healthcare organizations, it’s clear they’re interested in harnessing technology to deliver solutions beyond the needs of healthcare administrators or doctors. I also know they’re tired of being characterized as the “no” shop or being described as too slow, unresponsive, or a black hole where ideas and projects go to die. What contributed to this reputation? Probably CIOs being charged with trying to standardize and manage costs downward, a task on the other end of the innovation spectrum. Focusing on cost control may delay or hamper new ideas. It’s a constant back and forth between wanting to be seen as adding value to the organization—beyond keeping applications and the network running—and focusing on solving business problems. It’s safe to say that healthcare offers a unique and immediate challenge to innovate while keeping operations up and running at the lowest possible cost. It’s an information-intensive business that, until recently, has been one of the least interconnected. CIOs are expected to maintain a network with servers and a storage environment that boasts five nines of reliability (99.999% reliable). And they expect the technology to be business relevant. How do CIOs address a healthcare organization’s future needs while navigating a quickly changing technological landscape complicated by deadline-driven requirements to go digital? A few questions need to be answered: Are they trying to implement a mobility platform leveraging iOS application development for the iPad, iPhone, and iPod touch? Are they attempting to securely interconnect hospitals and other health facilities so these organizations can share an EHR? Are they installing telehealth services so doctors can quickly access high-resolution CT scans and provide critical diagnoses from a remote location? Is improving the patient experience a primary goal? Regardless of how CIOs are solving their business problems, the network is an important component to achieving success. The idea of interconnecting all those along the healthcare continuum goes beyond gaining operational efficiencies or meeting the latest meaningful use requirement; it’s realizing the promise of high-quality care, patient safety, and improving the customer experience. Complying with HIPAA and transitioning to an EHR are the first major steps. By 2014, the goal is to have 98% of healthcare providers up and running on an EHR. Progress has been made, but there is much left to do. 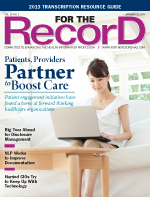 Adopting an EHR is one thing, and having it provide the desired results is another. Tangible success largely rests on the ability to securely interconnect hospitals and other health facilities to allow them to serve patients’ immediate needs. Speeding the patient admission process and providing diagnostic telehealth services are examples of how technology can bolster care. Numerous organizations—providers, insurance companies, hospital administrators, and pharmaceutical companies—are implementing more advanced telecommunications solutions, such as secure networking and video conferencing, that can handle demanding new applications. Still, the focus should never drift from patients, whose satisfaction with their experience carries enormous weight in a competitive marketplace. Healthcare organizations need to answer the following question: How can we ensure that when patients are discharged, they’ll leave with a positive impression of the care or service they received? One healthcare organization that’s already using its network to improve patient care and comply with HIPAA requirements is Shriners Hospitals for Children, which provides orthopedic, burn, spinal cord, and cleft lip and palate care. The specialty hospital group has implemented a state-of-the-art wide area network that interconnects its 22 hospitals, making it possible for physicians to instantly and securely share sensitive patient data and healthcare applications. Because Shriners physicians can tap into information and expertise at any of the organization’s facilities and engage leading specialists from other locations, its patients can get the most informed treatment possible. The hospital can deliver remote care via teleconferencing, video conferencing, and telemonitoring. As a result, its patients can meet with specialty doctors from different locations without expensive travel and receive faster diagnoses and treatment. Physicians also can use the technology to elicit decision support and second opinions from colleagues, actively participate in follow-up care, and receive direct feedback from patients regardless of distance. This type of telehealth has been shown to significantly reduce hospitalizations and emergency department visits, and improve mortality rates. The healthcare industry is no different than most business enterprises. It shares the same need to expand its network technology to meet the demands of emerging markets and bandwidth-intensive applications as well as to leverage that expansion to grow revenues in a more diverse business environment. However, more than any other industry, healthcare has the potential to use technology to enhance quality of life. In fact, where are the stakes higher than in healthcare, where the manner in which information is handled can be a matter of life and death? Interconnectivity is the next crucial milestone needed to enable burgeoning technologies that improve data sharing, delivery of care, and cost-efficiencies. The incentives are clear for organizations such as Shriners that embrace the opportunity to safely make the transition to the world of digital medicine. The advancement of technology is a vital tool, but while its importance can’t be denied, it will never replace the doctor-patient relationship. A physician, not a computer, will always make the diagnosis and prescribe treatment. Having a safe, reliable digital network available to every healthcare provider will only enhance that relationship, enabling physicians to be better informed as they access new medical technology and share patient information, insights, and medical opinions with each other regardless of location. — Mark Martinet is chief information officer at Level 3 Communications.